Turkey burgers are a popular alternative to regular beef burgers as they contain less fat. One problem with many commercial turkey burgers is that they are a nightmare in sodium content. 4 oz. of lean ground turkey generally contains around 60mg of sodium, less than traditional ground beef. It is also lower in saturated fat and calories. 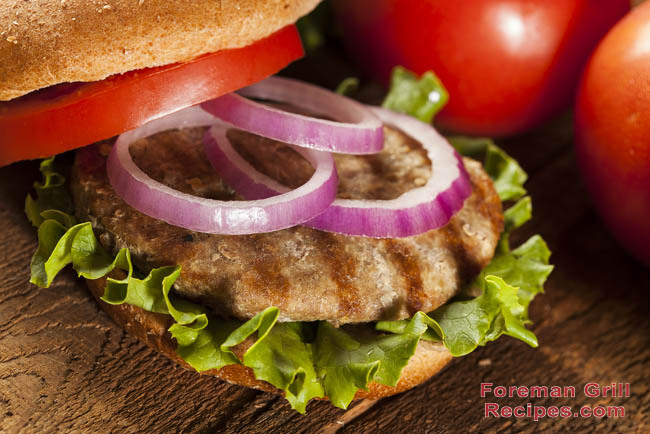 One of the main contributors to sodium in commercial turkey burgers are the fillers and the bun. Make sure you chose a fresh ground turkey from your local grocer that is not injected with additional sodium. Larger “gourmet” buns usually contain a ton of sodium. Often as much as 500mg! Sara Lee makes burger buns that are much lower. And many store brands also contain less sodium so be sure to look at the packaging. Of course, you could always skip the bun entirely. You’d also be saving 200-300 calories by doing so. This recipe uses a few spices to bring out the taste of the meat without using additional salt. A little onion powder, garlic powder, fresh ground pepper and liquid smoke goes a long way to boosting the flavor without boosting the sodium. So let’s grill up a nice low-sodium and healthy turkey burger! Preheat your grill for at least 5 minutes with the lid closed. Use the high setting if you have it. In a bowl, combine ground turkey, onion powder, garlic powder, pepper, parsley and liquid smoke and mix well. Shape into 4 4oz patties. Place on grill and close lid. Grill for 4-6 minutes. Serve on a low sodium bun with traditional burger condiments and enjoy!